Mert Alas & Marcus Piggott have made a shimmering impact upon our image culture over the past two decades. They have rewritten the rulebook for how to stage seductive voyeurism and activate our imaginations. They take the arena of fashion photography to one where social conventions and strictures can be suspended. The baton handed to them by their creative forebears Helmut Newton and Guy Bourdin, who dominated the well of French Vogue through the 1970s, centres on an understanding of human desire – of how to trigger it and, simultaneously, make us conscious of our viewership. We feel this in Mert & Marcus’s images when we encounter the darkest stories as if glimpsed through a keyhole into a dreadful and potent other world. Mert & Marcus deploy an assembly of visual cues to stimulate our imaginations. References to radical art movements and notably the Symbolists and Surrealists staccato through their work. We see Gustave Moreau’s Salome and Medea, Hans Bellmer’s nightmarish dolls, George Platt Lynes’s shadowed masculine forms, each recalibrated into contemporary scenes. Mert & Marcus are alchemists of sorts, who make new visual tales that can cause a chain reaction in our memory banks, leaving a far-reaching and indelible mark. Mert & Marcus’s photographic protagonists – constituted from the performances of the models, musicians and actors who are defining our age – appear wild, even predatory, yet deeply pre-possessed. A tenor of hyper-real excess, pulsing with sexuality, permeates their work with each out-of-time and otherworldly scenario creating the visual climate for each reveal. The sheer and impossible strangeness of all the scenarios that we encounter collectively build the definite drama of Mert & Marcus’s photographic world. Lit to perfection, each nuanced gesture is observed and captured by their astute camera. Their startling and dark approach transforms their original contexts – such as magazine pages and billboard posters – into twisted psychosexual tableaux. Mert & Marcus’s understanding of photography remains fundamentally as it began in the early 1990s – as a pluralistic medium grounded in experimentation. From the outset, their creative partnership has been about discovery and the challenge of how to visualise their imaginings. Their photographic signature shifts between the casual and elaborate – the glimpsed and strictly choreographed. At the heart of their modality is a shared history in the post-Punk environment of London where their partnership began in the early 1990s. They take the ultimate individualism of Punk – its defiance of conventions and dark romanticism – and reconfigure it in all of their iconic images. They customise and individualise everything with this sensibility and create fierce protagonists. Of course, they bring their own histories and experiences into play within the stories that they tell. We see, for instance, in their strong use of colour, a resonance with Mert Alas’s Turkish heritage, encoded with pre-modern symbolism and ancient emotion. Marcus Piggott’s absorption of his parents’ connoisseurship of art and antiques is carried into the creative duo’s sense of style that turns objects into subjects and stories – creating something new and tangible from what is old. Mert & Marcus are alchemists of sorts, who make new visual tales that can cause a chain reaction in our memory banks, leaving a far-reaching and indelible mark. 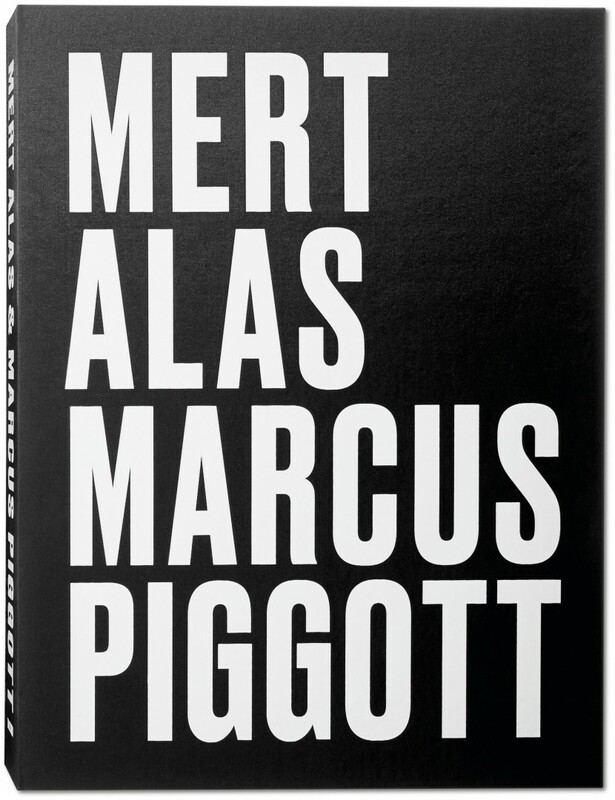 Excerpted from Charlotte Cotton’s introduction to Mert Alas and Marcus Piggott (Taschen, from £450).